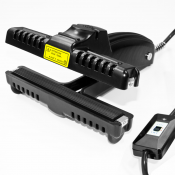 Ideal for light and medium-duty bagging operations, constant heat sealers are economical and easy to use. Also known as a direct heat sealer, a constant heat sealer can be a useful asset in many types of industries and for numerous applications. At Technopack Corp., we carry a big selection of constant heat sealers for light and mid-duty bag sealing. Our extensive lineup gives you maximum flexibility to find the style, size and price that is right for you and your business. Used to create a strong, solid and attractive wide seal area, constant heat sealers are effective with many heat-sealable materials, including BOPP, cellophane and laminations. Economical to purchase, these products are also inexpensive and easy to operate. For only a small investment, they will increase your efficiency and output. These machines are often used for food packaging, including items such as pastries, grains, spices, snacks and cookies. They are also popular for packaging coffee, nutraceuticals and many other types of products. Compared to a Technopack impulse sealer, a constant heat sealer will often be used to seal thicker bags with higher melting points. 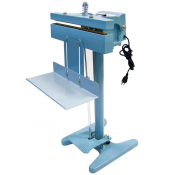 Constant heat sealers use a set of heated metal bars to fuse and seal bags. The heat, as the name suggests, is constant. Impulse sealers, on the other hand, deliver a short burst of heat generated by an electrical pulse. 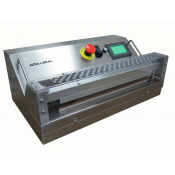 Constant heat sealers thus are able to deliver higher and longer inputs of heat than impulse sealers. Operating a constant heat sealer is easy. The operator puts a bag between the sealing jaws and presses on the preheated unit's pedal. Once the bag is sealed, the operator depresses the pedal, retrieves the bag and begins the process again. 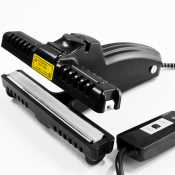 If you have questions about the constant heat sealers available from Technopack or are wondering which one is best for you, just give us a toll-free call or email us. Our advisors will give you quick, helpful answers.